universities and institutes for material properties research and quality control. Computer Control Utm is applicable for wide range of material for tension, compression, bending, shearing and low cycle test. Suitable for metal, rubber, plastic, spring, textile, and components testing. It is widely used in the corresponding industries, research and development, test institutes and training centers etc. Computer Control Screen Utm adopts hydraulic loading, Computer Display, easy and convenient to operate. It is mainly used to execute the tension, compression, bending, flexural etc. test for metal materials. Attached with simple accessories and devices, it can be used to test wood, concrete, cement, rubber, and so on.It is very suitable for making test to different metal or nonmetal materials under high toughness and hardness against extreme big loading force. 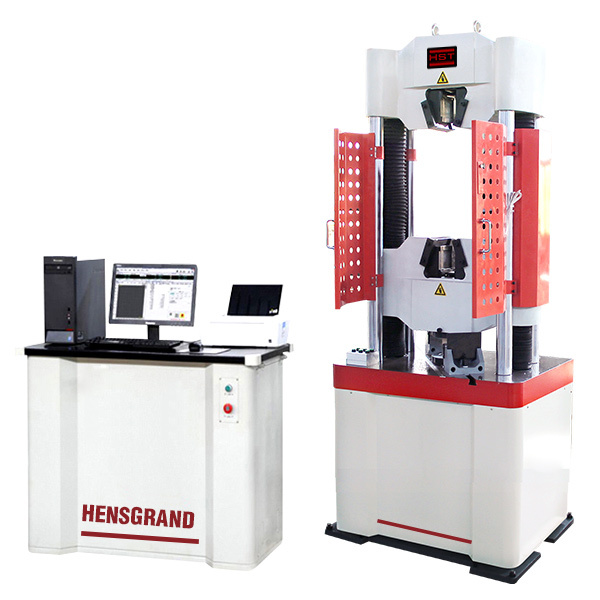 Pendulum Impact Tester is used to determine the impact toughness of metal materials under dynamic load according to ISO148, ASTM E23 and EN 10045. It is suitable for laboratory, metallurgy industry, machinery production, steel plant and other fields. There are three types of models: JB, JBS & JBW series. Digital Compression Testing Machine mainly used for brick, cement, concrete and other material compressive strength testing. Widely used in metallurgy, building materials, space flight and aviation, colleges and universities, R&D institution lines. The test operation and data processing meets standard requirements. Hydraulic Fatigue Testing Machine is ainly used to detect a variety of metals, non-metallic materials and small movable member, the static mechanical properties test. It can do tensile, compression, bending, low cycle and high cycle fatigue, crack growth, fracture mechanics test under sine, triangle, square wave, trapezoidal wave, random wave, combination waveform. Looking for ideal Universal Tensile Testing Machine Instron Manufacturer & supplier ? We have a wide selection at great prices to help you get creative. All the Admet Universal Testing Machine are quality guaranteed. We are China Origin Factory of Geotextile Universal Testing Machine. If you have any question, please feel free to contact us.